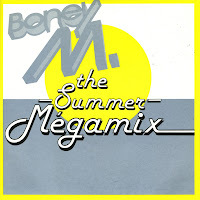 There's nothing wrong with a bit of Boney M now and again, and regular visitors of this blog will know that I already own a pretty impressive row of Boney M singles - some of which I have bought for a second time in the mean time because those early singles were ruined by my younger self. The fact that my wife actually likes their music - which is a feat in itself, because for some strange reason she seems to prefer folk like Bach - also helps. 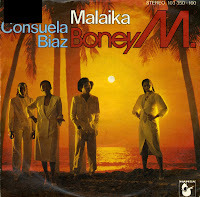 This Spanish single from 1982 presents a medley of the group's biggest hits. Listening to it you'll have to admit this sound more like a quickly edited track than a professional remix. I don't know if it was a hit in Spain, but it's a nice item nonetheless. Collecting Boney M singles has become a very amusing pastime for me. The original singles from the Seventies are all in my collection, but in the second half of the Eighties an endless stream of remixes was apparently released on single. I have already found a couple of these (and you can see them on this blog here), but yet another one turned up. This one is the 'Lambada remix' of 'Malaika'. It was not a very commercial song to begin with, and this remix doesn't help matters much. There isn't a lot of Lambada in this remix and the added beats don't get one on their dancing feet. Well, at least the B-side is more interesting: a Nineties remix of that song that started it all, 'Baby do you wanna bump'. Bobby Farrell died last month, legendary dancer of Boney M, who also lipsynched so well to the words that were in actual fact sung by producer Frank Farian. 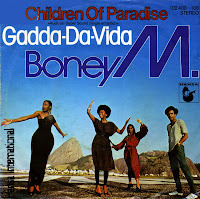 I didn't write an entry about Boney M at the time since all my Boney M singles were already up on this blog. But I've found a new single to write about. This '88 remix of 'Rivers of Babylon' was released in Germany to celebrate the reunion of the original line-up of the band, including the aforementioned Bobby Farrell. The remix-album 'Greatest hits of all times' was as unsuccessful as this ill-fated single. Boney M officially disbanded after the commercially unsuccessful and ininspired album 'Eye dance' (1985). From that point, several different versions of the group were formed. The classic line-up reformed in 1988 for the album 'Greatest hits of all times - remix 88', but this reunion didn't last very long: within the year Liz Mitchell left the group, to be replaced by Madeleine Davis. This line-up recorded the single 'Josephine Baker', without the band's original producer Frank Farian's knowledge or approval. He threatened the group with legal action, and so the single was quickly withdrawn. 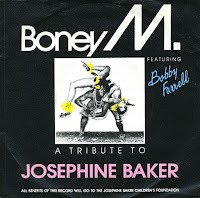 Bobby Farrell re-recorded the song for this 1991 single credited to Boney M. feat. Bobby Farrell, since he won the rights to use the name Boney M. in Holland where he lives. The title was changed simply to 'Josephine Baker'. The single was a charity single in support of The Josephine Baker Children's Foundation, but did not chart. With Bobby Farrell out of the line-up of Boney M and new male singer Reggie Tsiboe in, the group was facing difficult times. With already three singles landing outside of the top 40 in Germany, 'Somewhere in the world' was the fourth attempt at having more success - but another failure. 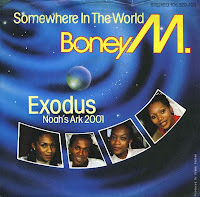 'Somewhere in the world' was the first and only single from Boney M's seventh studio album 'Ten thousand lightyears'. The single only reached number 49 in the German singles chart and failed to chart anywhere else. Though unremarkable, this track is still quite beautiful and features the London Philharmonic Orchestra. By the end of 1981, Boney M was in a little trouble. They'd recorded the album 'Boonoonoonoos', originally scheduled for release in November 1980, but released almost a year later because of the recording sessions dragging on. Boney M's 'Christmas album' was released almost at the same time in November 1981. By that time, male member Bobby Farrell was fired from the group due to his unreliable working discipline. It did not hinder the Christmas album so much, as it became a holiday favourite for all the band's fans. The single 'Little drummer boy' was a bit of a secret though. I never saw it back in 1981, and last January I saw it for the first time in my life. Boney M's version of this traditional is pretty decent, but the medley of hits on the B-side is the real treat here. 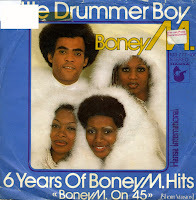 The height of Boney M's success was gone, vanished by the end of the Eighties. 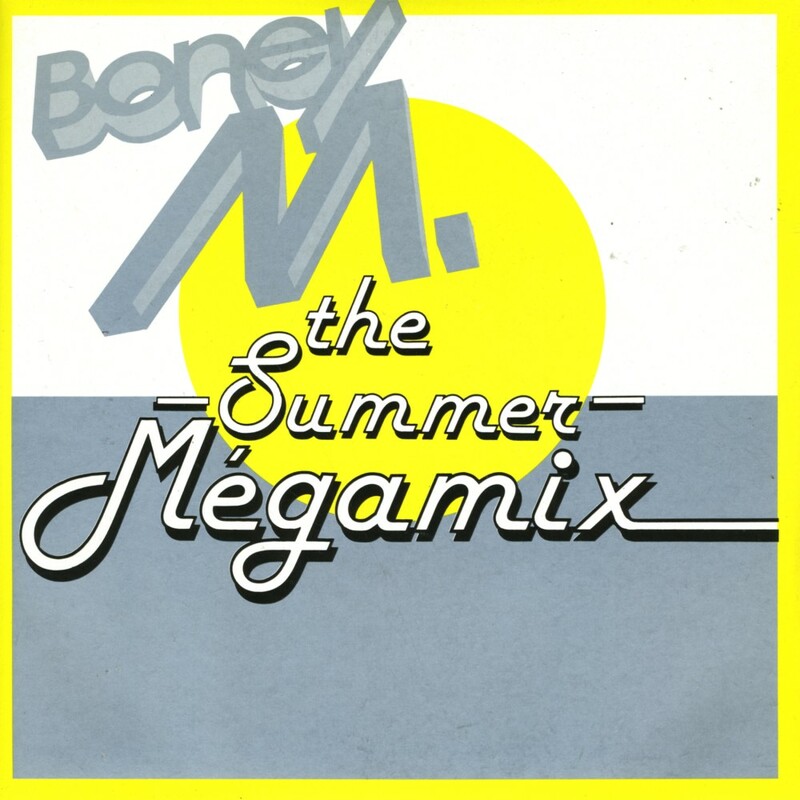 Still, someone thought it would be a good idea to release a 'Summer Megamix', consisting of their biggest summer hits: 'Sunny', 'Ma baker', 'Hooray! Hooray! It's a holi-holiday', 'Gotta go home' and 'Kalimba de luna'. The megamix was made by Michael Newman and Charles Key B, together with Pete Hammond from Pete Waterman Limited. The single was, as far as I know, only released in France, peaking at number 11 in the French singles chart. When Abba had a comeback of sorts with the 'Abba Gold' compilations in the early Nineties, other acts followed suit. 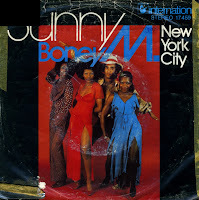 'Boney M Gold' was released in 1992, and this single was released to promote the compilation. It was a megamix of five big Boney M hits: 'Rivers of Babylon', 'Sunny', 'Ma Baker', 'Daddy Cool' and 'Rasputin'. At a time when Seventies acts were anything but cool, this Megamix was a surprise hit, peaking at number 13 in the Dutch Top 40. The word 'ill-advised' comes to mind whenever I hear this song. Several ill-advised things happened with this single. First of all, Boney M sang a song about nuclear weapons, which is a very serious subject and not necessarily compatible with their variety of carefree dance music. Then there's the last two minutes of this song, performed with a children's choir. Much too saccharine. And then there was the unfortunate dismissal of Bobby Farrell, rendering the band unable to promote the single. 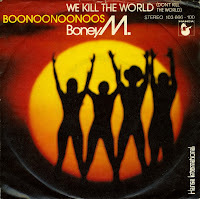 The single was taken from Boney M's 1981 album 'Boonoonoonoos' and reached number 25 in the Dutch Top 40 and number 39 in the UK singles chart. 'Sunny' was originally written and performed by Bobby Hebb in 1966. It was covered by Boney M in 1976, and released as a single from their debut album 'Take the heat off me', following their breakthrough single 'Daddy cool'. Hebb himself released a disco version of the song, also in 1976, and had minor success on Billboard's R&B chart. Boney M's version topped the charts in Germany and the Netherlands and reached number 3 in the UK. The track was remixed in 1988 and 1999, but when released as singles they didn't have the same amount of success. While Liz Mitchell sang the original lead vocals on Boney M.'s version, original member Maizie Williams recorded a solo version in 2006. Malaika means 'Angel' in Swahili. The song was first recorded by Kenyan musician Fadhili William and his band Jambo Boys in 1960. In 1981, the song was covered by Boney M for their album 'Boonoonoonoos'. The single reached number 13 in the German charts and number 20 in the Dutch Top 40. These lower placings were a first sign of Boney M's popularity decreasing. In the Netherlands, they would never reach the top 20 again (except for a Megamix released in 1993, which reached number 13). 'Kalimba de Luna' was originally released as a single by Italian musician Tony Esposito in 1984. It was covered almost instantly by Boney M for the German market. The lead vocals were performed by new group member Reggie Tsiboe, who was originally scheduled to release it as a solo single. 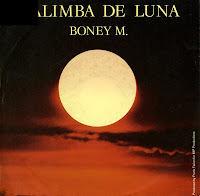 The plans were changed, and 'Kalimba de luna' became a new Boney M single, released in the autumn of 1984. Neither Liz Mitchell nor Marcia Barrett sang on this recording - the backing vocals were done by producer Frank Farian, Amy & Elaine Goff, and vocal group La Mama (Patricia Shockley, Madeleine Davis and Judy Cheeks). 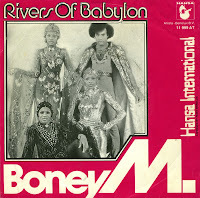 The single became Boney M's first hit single in three years, peaking at number 27 in the Dutch Top 40. 'Rivers of Babylon' is a song written and recorded by Brent Dowe and Trevor McNaughton of The Melodians in 1972. It is based on the Biblical hymn Psalm 137, a hymn expressing the yearnings of the Jewish people in exile following the Babylonian conquest of Jerusalem in 586 BC. The rivers of Babylon are the Euphrates river, its tributaries, and the Chebar river. The song also has words from Psalm 19:14. The song was covered in 1978 by Boney M, with a version that was released as a single. In the UK Boney M. sold more than 1,985,000 copies of the song, making the single officially three times platinum and one of the all-time best-selling singles in the UK. It was also the group's only significant US chart entry, peaking at number 30 in the Pop charts. 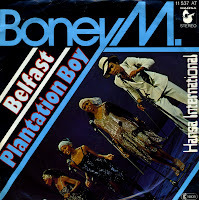 Some controversy arose when the first single pressings only credited Frank Farian and Reyam (aka Hans-Jörg Mayer) of Boney M; after an agreement with Dowe and McNaughton, these two were also credited on later pressings. 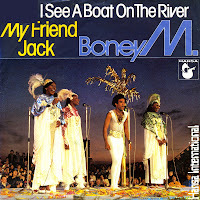 Not long after the American band Styx released their single 'Boat on the river', Boney M released 'I see a boat on the river'. It was another big hit for the band, reaching number 7 in the Netherlands. 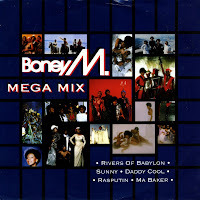 The track appeared on the compilation album 'The magic of Boney M', along with the B-side, 'My friend Jack'. This track was released as an A-side in the UK, but only made number 57 there. 'Belfast' was originally written by Drafi Deutscher for Marcia Barrett while she was still performing as a solo artist in the early Seventies. Boney M performed the song live because they didn't have enough of their own material yet, and it proved to be an audience favourite. This gave producer Frank Farian the idea to record it anew. However, because of the politically tinted lyrics ('when the hate you have for one another's past') he first recorded it with Gilla in German. It still appeared on Boney M's 1977 album 'Love for sale' and ended up being a single for them. It peaked at number 9 in the UK and number 3 in the Netherlands. A disco song about Russian history, now there's something that hadn't been tried before! 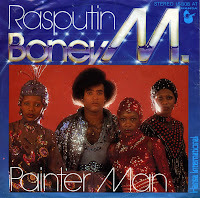 Boney M recorded and released 'Rasputin' in 1978, a song about Grigori Rasputin who alledgedly healed Tsarevich Alexei of Russia from haemophilia in the first years of the twentieth century. While 'Rasputin' accurately indicates that unfavorable rumors damaged Grigori's reputation, there is no verifiable evidence to suggest that he had an affair with Alexandra. 'Rasputin' peaked at number 8 in the Netherlands and number 2 in the UK. In the Netherlands, the B-side was 'Painter man', which was released as an A-side in the UK, peaking at number 10. The B-side of 'Rasputin' in the UK was 'Never change lovers in the middle of the night'. I bought the UK single back in 1981 and got the European pressing recently. Both B-sides are here for your enjoyment. In 1979 Boney M released their fourth album 'Oceans of fantasy'. 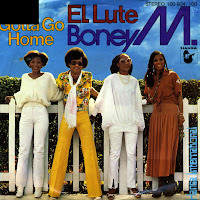 The album contained two hit singles, of which 'Gotta go home / El Lute' (a double A-side single) was the first. 'Gotta go home' is an upbeat summer track, released just in time for the season. The track 'El Lute' was based on the life of Spanish outlaw and writer Eleuterio Sánchez. The single was another hit for the German band, reaching number 12 in the UK and number 2 in the Netherlands. I bought the single while it was still in the charts. 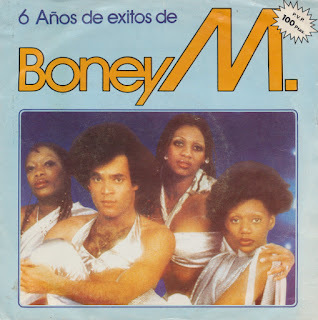 As young as I was, Boney M had an irresistible appeal to me. 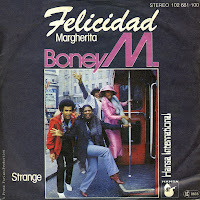 Boney M released the single 'Felicidad' in 1980. The song was not included on any studio album. It was a cover of one hit wonder Massara's 'Margherita'. The single peaked at number 6 in Germany, but failed to chart in other countries. Due to a frosty relationship to the group's members at the time, producer Frank Farian tried to record it with session singers Cathy Bartney, Patricia Shockley and Madeleine Davis plus himself only on vocals. He was then forced by record company Hansa to overdub Boney M. singers Liz Mitchell and Marcia Barrett's vocals. 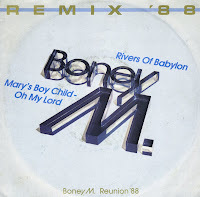 'Children of paradise' was released as a single in autumn of 1980 to fill the gap between Boney M's 1979 album 'Oceans of fantasy' and the 1981 album 'Boonoonoonoos'. The single featured the religiously-inspired title track and a disco cover of the 1968 psychedelic track 'In a gadda-da-vida' by Iron Butterfly. 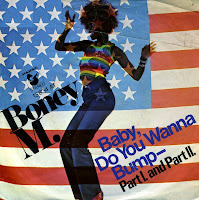 As usual, the single became a Europe-wide hit for Boney M. I bought the single as soon as it came out. Aged 10, I bought all of Boney M's singles at the time. Frank Farian (Franz Reuther), a German schlager singer, wasn't happy with the choice of material his record company wanted him to sing. He went into the studio in December 1974 and recorded the single 'Baby, do you wanna bump', singing the title in a deep voice (entirely studio created) as well as performing the high female chorus vocals in his falsetto voice. The music was based on Prince Buster's 'Al Capone' (1967). When the single was released, it was credited to 'Boney M'. Farian had been watching an Australian detective show, in which the lead character was called Boney, and Farian decided that this would make a good name for a group, and added the M. After a slow start it became a hit in the Netherlands, reaching number 14 in the Dutch Top 40 in January 1976. Because of this success, Farian decided to hire a team to 'front' the group for TV performances. Thus the group was born!